I regularly receive emails and inquiries from people asking about the topic of Native appropriations in fashion. The questions are straightforward, yet complex: "What is it? Am I doing it right now? 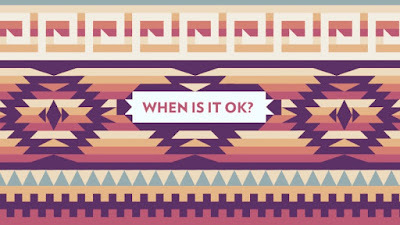 When is it ok? I love Navajo prints, can I wear Native American fashion? How can I educate myself and my friends about this topic?" The questions are great, because it means people are interested, and I often send them to the same articles and online resources that break down this complicated topic into digestible bits. I've included these favorite articles below. 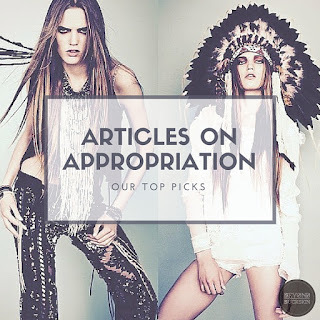 This selection can serve as a launchpad of sorts, because each post includes additional links that can send you down the appropriation education rabbit hole (if you want). Thankfully, many different voices have contributed to this discussion, and there are a variety of resources available. Feel free to add any additional links to your favorite articles or websites in the comments section below. Katie J.M. Baker knocks it out of the park with this comprehensive and to the point primer on cultural appropriation. It is straightforward and intended for readers of all backgrounds. Read, and share this one widely. Native Appropriations: But Why Can’t I Wear a Hipster Headdress? The top resource when it comes to Native American cultural appropriations in pop culture, is of course, Native Appropriations blog. This site is smart and sassy, covering topics that range from mascots to Hollywood Indians - if you've been a naughty appropriator, you will be critiqued. Métis badass Chelsea Vowel breaks it down in this Hall of Shame open letter. She explains the importance of restricted cultural symbols, and offers concrete examples of how to celebrate Native cultures, and not appropriate. This post by Connie Wang spotlights Navajo fashion designers and artists in a well-written article about the pitfalls of appropriation. Bonus: There's a really gorgeous video, shot in Navajoland, that accompanies this post. The ladies at Threadbared bring together a variety of links into one post, pulling out some key quotes and discussion points. They are also the brains behind the Of Another Fashion page, which serves as an alternative archive of the not-quite-hidden but often ignored fashion histories of US women of color. Be prepared to be inspired. Fashion law scholar Susan Scafidi discusses the questions of where we draw the line between cultural inspiration and cultural appropriation. And, why in the heck do stars and stylists alike continue to risk offense with headdresses and red-face? Mniconjou Lakota writer Taté Walker offers up some positive alternatives to appropriation: instead, support Native American artists, learn about Native-led movements, call out appropriation because it’s offensive, and support companies or organizations that actively honor Native cultures and/or creations. 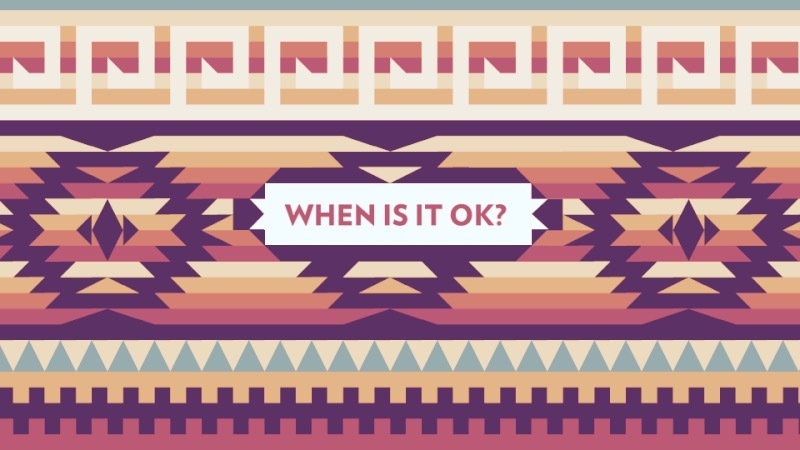 Considering the recent rampage of crazy Native appropriations in mainstream culture, I came up with this guide, which details step-by-step advice on how to critique companies, make some demands, and hopefully see some results. Not a big reader? Fear not, this short 6 minute video tackles seven myths about this topic. From "Don't you have bigger problems?" to "Quit infringing on my rights!" to "Leave white people alone!" Ha, this video is great. And last, but not least, a fun bonus! This spoof video of "DW Diaz's New Urban Infitters Line: Genocide Chic" is hilarious. A classic. Enjoy! The ladies at Threadbared bring together a variety of links into one post, pulling out some key quotes and discussion points and geometry dash apk online.